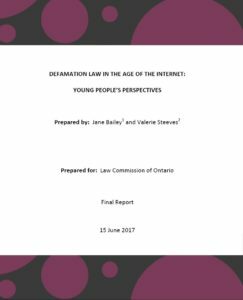 eQuality researchers recently completed a project funded by the Law Commission of Ontario (LCO) on Defamation Law in the Age of the Internet, which focused on Canadian youth’s perspectives on defamation. We conducted interviews with 20 participants between the ages of 15-21 concerning their experiences with truth and falsity, reputation, anonymity, and the quality and utility of existing mechanisms for responding to defamatory attacks online. Participants noted that their differing self-presentations were often driven by a desire to satisfy the requirements of the various social media platforms, and that their construction of different profiles was often driven by their desire to protect their important rights such as equality and free expression. Participants felt that while untrue statements can hurt their reputations, true statements that violate confidentiality and privacy could be just as harmful. The true but harmful situations described by our participants often involved non-consensual disclosure of intimate images. We found that, except in the most extreme cases of online attacks, such as those involving racism and sexual violence, young targets prefer responses that maintain privacy and confidentiality, while preserving transparency and accountability. To read the full report, please follow the link here.